KDO has been offered a free tour of the recently renovated Governor’s Mansion! There are three time slots available and will be limited to 30 people per tour. Feel free to bring a friend along, just please remember to fill a time slot for them as well! Thanks to Cathy Schwartz for organizing this wonderful opportunity! To register for the event please see the signup below. 2018 is a year of celebration for The King's Daughters Organization(KDO) and the celebration continues on July 17th, at an old fashioned an Ice Cream Social. KDO is providing vanilla and chocolate ice cream, cookies and water to the first 300 guests, or as supplies last. Come eat ice cream and cookies at Douglas Park while listening to the sounds of the Springfield Municipal Band. Join us for refreshments starting at Shelter #3 from 6:30pm - 9:00pm. The band starts at 7:30pm. There is limited permanent seating or bring chairs or blankets for picnic style seating while watching the band. “We are proud to share this fun event with the community, and we appreciate the support of sponsors Ameren, Sam’s Club, Schnuck’s on Iles and Walmart”, says Laura Carmody, the event chairperson for KDO. “We hope to see you on Tuesday for some summer fun with ice cream, cookies and live music”. 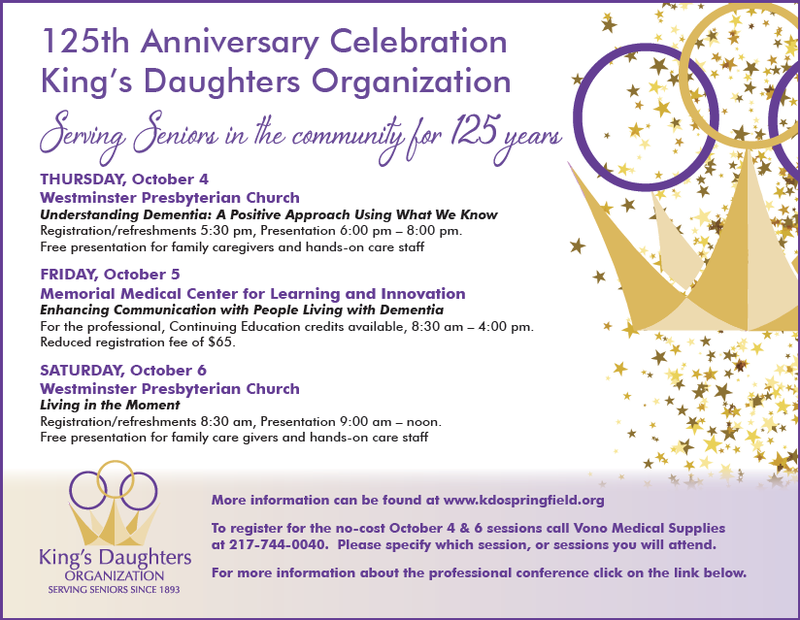 We will be celebrating KDO's 125th anniversary and the longest active women's organization in the state of Illinois! SIU Medicine’s Center for Alzheimer’s Disease and Related Disorders is conducting their new Minds in Motion program designed to improve or maintain participants cognitive, physical and emotional health. SIU Medicine Center trained staff, supported by volunteers, offer multi-sensory themed programs, a healthy lunch and tai-chi practice the first and third Wednesday of each month from 10 a.m. until 2 p.m. at the First United Methodist Church, 2941 S. Koke Mill Road, Springfield, IL. Minds in Motion is supported by a grant from King’s Daughters Organization. Grants will be awarded and new officers and directors elected. Come Join us for a fun filled afternoon at the Rail Golf Course. Proceeds from this event will benefit seniors of Sangamon County. Teams will be comprised of four individuals at a cost of $125 per person. Registration fees include your green and cart fees, lunch and dinner. Sponsorships are also available from $100 to $2,500. One of the most dazzling and sybaritic women in 20th century America was also a native of Springfield, IL. I am referring to Marjorie Merriweather Post, the sole heir to the General Foods fortune. She was born on March 15, 1887 at 541 Black Ave, in a home owned by her grandparents, Charles Rollin and Carrie Post. In 1893, her family home was purchased by the King’s Daughter’s Organization and operated by them as a home for aging women who were unable to care for themselves. Marjorie’s father, C. W. Post, contributed funds to help King’s Daughter’s establish an endowment fund to support the charitable function as a memorial to his mother, Carrie Post. Over the years of its operation, Marjorie also made contributions, including a contribution to help make possible the addition to the home in 1921. Sangamo Club at 227 E. Adams St, Springfield, IL 2701. Lunch is $22 and reservations can be made by calling 217 544-1793. Did you know that veterans are at an increased risk for Alzheimer’s disease? Join us to learn more about memory loss, Alzheimer’s disease and why early detection is the best way to increase the quality of life for those diagnosed and their families. Call today and join us for this valuable education program! Shop at Talbot's in the Gables on October 4th from 4-7 p.m. and 10% of your purchase will be donated to the mission of The King's Daughters Organization. The walk is on Saturday, September 23rd. You can register and find additional information at the website above. Our team name is KDO- Mary H. Blackstock.